Medicinal plants constitute an important component of the pharmaceutical industries and primary healthcare system at local level. Approximately, 80% of the world populations depend on ethnomedicines for primary health care. Pakistan has reportedly over 1 000 medicinal plant species that are mostly being used by the rural population in various herbal remedies. Main reasons for the ethnomedicinal uses are their availability, low cost, fewer side effects and associated ancestral experiences. The medicinal efficacy of such plants against pathogenic infections is due to the presence of phytoconstituents including alkaloids, glycosides, resins, flavonoids, triterpenes, phenolic acids, alcohols, carotenoids and mucilage. Pathogenic bacteria are involved in causing serious infectious diseases that successively result in mortality and morbidity among the population, especially in developing countries. The pharmaceutical industries are keen to develop new drugs due to the constant emergence of microbial resistance to conventional medicines. As an example, the multi-drug resistance of Staphylococcus aureus (S. aureus) makes it one of the most stubborn pathogenic bacteria against antibiotic efficacy. S. aureus causes many human ailments including endocarditis, staphylococcal scalded skin syndrome, septic arthritis, and respiratory problems. It is estimated that S. aureus has 25%–35 % infection rate worldwide. In Pakistan, a high prevalence rate (42%–51%) has been observed for methicillin resistance in S. aureus. Skin soft tissues' infections due to S. aureus are ranging from benign to the immediately life threatening. S. aureus is one of the important causative agents of pneumonia, with 97% cases being reported in children from tropical and subtropical developing countries, and 50% from India, China and Pakistan. Most of these infectious diseases are being treated by using ethnomedicinal recipes derived from plant species. A large number of in-vitro studies have been conducted on the medicinal flora of Pakistan against S. aureus. Out of these medicinal plants, certain species are therapeutically effective due to the presence of active phytochemicals. However, most of such data are available in individual research studies and can scarcely be found collectively. Hence as per our knowledge, this is the first attempt to review all the scattered literature on ethnobotany, phytochemistry and in-vitro activities of Pakistani medicinal plants locally being used against common infections caused by S. aureus. 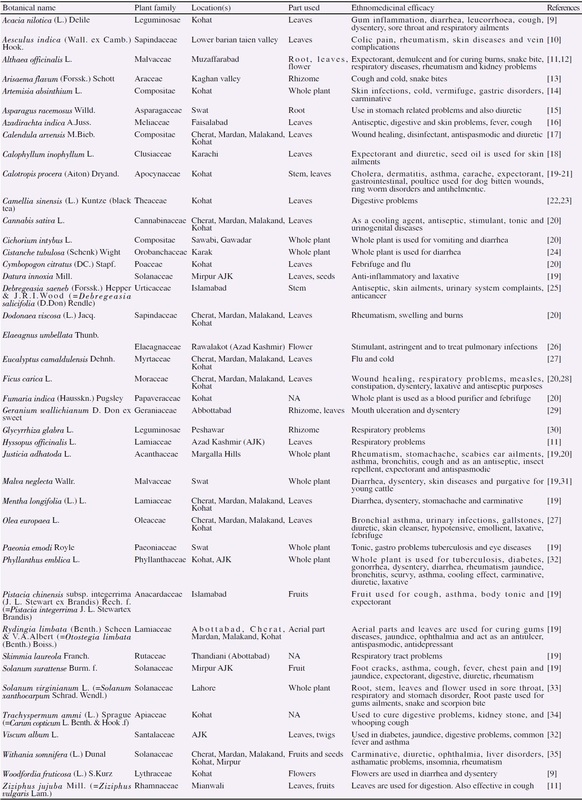 A large number of published and unpublished research studies related to the ethnomedicinal, phytochemical and anti-S. aureus activities of flora of Pakistan published between 1990–2018 were reviewed by using online bibliographic databases like Science Direct Navigator, Pub Med, Google Scholar, ResearchGate and libraries. Data was gathered on in-vitro activities of plants extracted by using different solvents including ethanol, chloroform, methanol, n-hexane and ethyl acetate. Extracts of different plant parts have been reported for in-vitro screening against S. aureus. However in this review, we focused only on those plants, whose extract concentrations were quantitatively listed in the literature, i.e., milligrams of extracts dissolved in milliliters of the respective solvent. Therefore by keeping the above mentioned criteria, a total of 86 medicinal plants reportedly having anti-S. aureus activities were selected for this review. Furthermore, we documented all the available information on the phytoconstituents and ethnobotany of the selected plants in order to establish their relation with the anti-S. aureus activities. Plant databases such as “Flora of Pakistan” and “The Plant List” were used for taxonomic corrections of the reported plant species. In this study, the selected literatures have been represented in tables and figures. 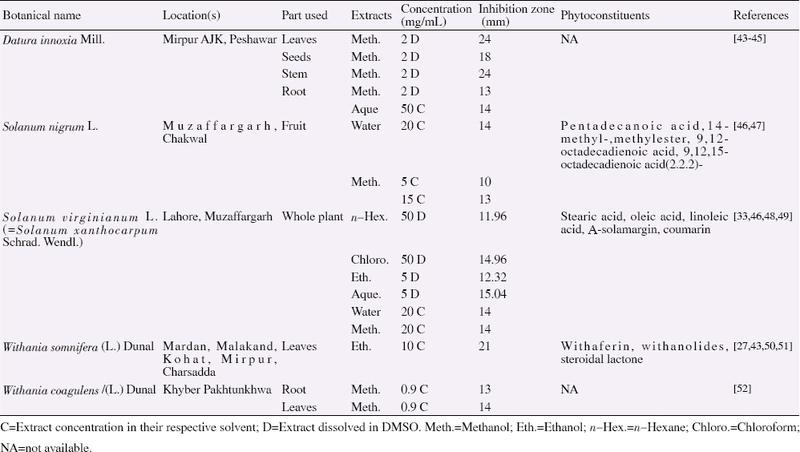 [Figure 1] shows the selection criteria for the documented plant species in this review that are extracted with different solvents in Pakistan. These plants have shown both qualitative and quantitative in-vitro activities against different bacteria. Further, the graph shows a comparison of a total number of plants to that of selected plants, which showed activities against S. aureus. [Figure 2] and [Figure 3] show Pearson correlation coefficients for the determination of two-tailed significance between plant extracts of a particular solvent and inhibition zone of S. aureus. [Table 1] contains ethnomedicinal data, while the remaining [Table 2],[Table 3] and [Table 4] contain data on phytochemical constituents and anti-S. aureus activity of selected medicinal plants belongs to Lamiaceae, Solanaceae and Compositae families. Data on the phytochemical and anti-S. aureus activities of medicinal plants from the rest of families are mentioned in [Table 5]. Data on extract concentrations are presented in mg/mL, while zone of inhibition in mm. 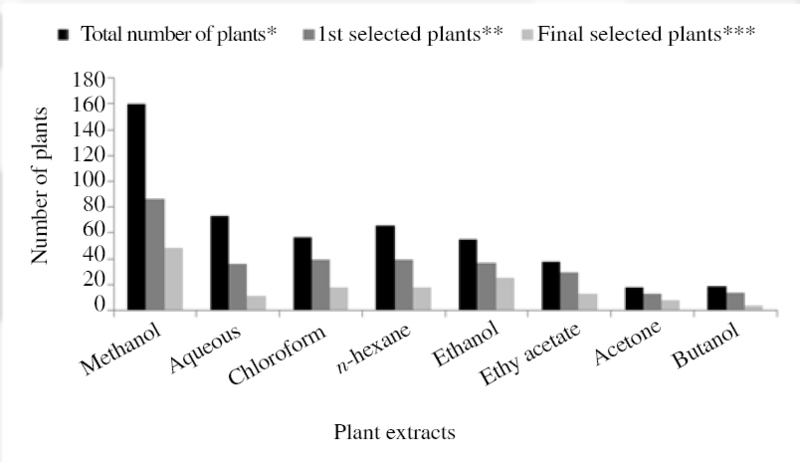 Figure 1: Plants extracted with different solvents. *Total number of plants extracted with a particular solvent and used against all types of bacteria **Number of plants extracted a particular solvent and used against S. aureus and presenting both quantitative and qualitative data on inhibition. ***Number of plants used against S. aureus and presenting effective quantitative data on inhibition. Figure 2: Relationship between extract concentrations and S. aureus inhibition zone of respective solvents. Figure 3: Relationship between extract concentrations and S. aureus inhibition zone of respective solvents dissolved in DMSO. Table 1: Ethnomedicinal uses of Pakistani medicinal plants. Table 2: Phytochemical and pharmacological data of effective Pakistani medicinal plants belong to Lamiaceae family against S. aureus. Table 3: Phytochemical and pharmacological data of effective Pakistani medicinal plants belong to Solanaceae family against S. aureus. Table 4: Phytochemical and pharmacological data of effective Pakistani medicinal plants belong to Compositae family against S. aureus. Table 5: Phytochemical and pharmacological data of effective Pakistani medicinal plants against S. aureus. In Pakistan, different techniques are being applied for the extraction of active metabolites from medicinal plants, which include infusion, maceration, soxhlet, decoction and percolation. The selection of a technique mainly depends upon the nature of solvent and metabolites solubility. Methanol, aqueous and ethanol are the preferable solvents used for plants extraction across the world. This might be due to the solvent polarity as they can easily degrade the cell wall and extract polyphenols from the plant cells. Polyphenols are aromatic or saturated organic compounds in nature and carries sound antibacterial activities. Out of 86 studied plants, 86 plants were reportedly extracted with methanol [Figure 1]. Similarly, 37 plants were reportedly extracted with ethanol, 39 plants with n-hexane, 39 plants with chloroform, 36 plants with water, 29 plants with ethyl acetate, 13 plants with acetone, and 14 plants were extracted with butanol [Figure 1]. Correlation analysis showed that increase in methanolic extract concentrations (mg/mL) had significantly increased the antibacterial activity against S. aureus at r=0.8; P<0.01 [Figure 2] and r=0.60; P<0.01 [Figure 3]. In a similar way, increase in aqueous extract concentrations (mg/mL) had significantly increased the S. aureus inhibition zone at r=0.8; P<0.01 [Figure 2]. Water is a universal solvent used for medicinal plants extraction. Chloroform has been proved as an important solvent for the extraction of different compounds such as isolation of aglycon of deoxy-niazimicine from Moringa oleifera. Likewise, n-hexane is preferably used for the extraction of edible oils from natural sources. Butanol is not the widely used organic solvent for extraction; however, considered best for the extraction of phenolic compounds. Pakistan is blessed with diversity of medicinal plants, which play a key role in safeguarding the human health since long. Approximately, 40 000 registered traditional practitioners in the country are using these plants (mono-and poly-herbal remedies) for providing primary health care facilities to a majority of rural population. At present, about 50% of the total plant-derived drugs are mono-herbal and the remaining 50% are poly-herbal. Moreover, a number of modern allopathic drugs also belong to the plant origin. This study presented 86 plant species with reported antibacterial activities against S. aureus. Lamiaceae and Solanaceae families have also been reported in the literature with maximum number of plants being tested for antimicrobial activity,. This is because most active compounds have been isolated from the oil of their plants, hence providing us with an opportunity to test the unexplored plant species (part wise) of these families against S. aureus. Different plant parts such as rhizomes, roots, stems, barks, leaves, flowers, fruits and seeds are used traditionally in various herbal remedies. Leaves are the most commonly used part, because these are the sites of high photosynthetic activity and secondary metabolites, and they usually do not result in the fatality of mother plant [Table 1]. Traditionally, these medicinal plant parts are not only used to treat infectious diseases but also other diseases like stomachache, fever, gastrointestinal disorders, skin problems and cleanser, wound healing, gallstones, and whooping cough,,. These traditional practices are more common in rural areas having less access to physicians, while this knowledge comes to them from their ancestral strong beliefs on plant efficacy with fewer side effects. These medicinal plants also have in-vitro proofs for the activities like antispasmodic, anti-inflammatory, anticancer and antiparasitic,, and could be very effective against multi-drug resistant microorganisms. World Health Organization recognizes antibiotic resistance as a global concern, which resulted in more than 25 000 deaths per year in the European Union and costs more than 1.5 billion per year in healthcare expenses and productivity losses. Similarly in the USA, about 2 million people acquire serious infections caused by bacterial resistance to at least one recommended antibiotic. The emergence of antibiotic resistance and dearth of new antibiotics threaten the ability to treat patients with infectious diseases. Starting with penicillin and methicillin, S. aureus has demonstrated a unique ability to quickly respond to each new antibiotic by the development of a resistance mechanism. Such mechanisms include enzymatic inactivation of the antibiotic (penicillinase and aminoglycoside-modification enzymes), alteration of the target with decreased affinity to antibiotic (notable examples being penicillin-binding protein 2a of methicillin-resistant S. aureus), trapping of the antibiotic (for mycin and possibly daptomycin), efflux pumps (fluoroquinolones and tetracycline), and resistance developed due to spontaneous mutations and positive selection. Therefore, a dire need is to develop new medicines (synergistic or additive effects) from plants to cope up with the emerging global public health threat of antibiotic resistivity. This review provides detailed information on the pharmacological evidence of anti-S. aureus plant families, and baseline to pharmaceutical industries for the production of new antibiotics. Methanolic extract of leaves of Hyssopus officinalis (H. officinalis) at increasing concentrations has shown increased S. aureus inhibition. Phytochemicals like pinocamphone, isopinocamphone, linalool and 1,8-cineole isolated from the oil of H. officinalis have reportedly shown notable antibacterial activities. Pinocamphone compound can abundantly be found in the oil of H. officinalis and hence needs to be tested for minimum inhibitory concentration (MIC). According to Subhan et al., ethanolic extract of Mentha longifolia has 12 mm inhibition at 10 mg/mL [Table 2], with MIC and minimum bactericidal concentration (MBC) values of 1.5 and 2.5 mg/mL, respectively. This activity may be due to the phytochemicals including oxygenated monoterpenes, isomenthone, 1,8-cineole, borneol, and piperitenone oxide. Ethanolic and methanolic extracts of Rydingia limbata also showed good inhibitory activities, which may be because of phytochemicals like limbatolide B and limbatolide C, oleanolic acid and b-sitosterol,. Chloroform, n-hexane, ethyl acetate and methanolic extracts of Teucrium stocksianum were tested for their anti-S. aureus activities, out of which ethyl acetate has shown maximum inhibition (24 mm) at the 1 mg/mL concentrations. Acetone extract of aerial parts of Salvia cabulica produced maximum inhibition zone (14 mm) against S. aureus, while petroleum ether, butanol, and aqueous extracts have shown no activity at 1 mg/mL. In total, five plants belonging to the Solanaceae were tested for in-vitro activities against S. aureus [Table 3]. Methanolic extract of Solanum surrattense showed increased inhibition with increasing concentration. Out of different methanolic extract concentrations of Solanum virginianum, the chloroform showed maximum inhibitory zone (17.06 mm) at 100 mg/mL. Ethanol showed moderate inhibition at all concentration, n-hexane and aqueous at 50 and 100 mg/mL concentrations did not show any activity. The phytochemicals isolated from Solanum virginianum including stearic acid, oleic acid, linoleic acid, Α-solamargin, and coumarin may possess these antibacterial activities. The antibacterial potential of stearic acid, oleic acid and linoleic acid has already been tested in a study. Ethanolic extracts of Withania somnifera has greater inhibitory effect as compared to its methanol extract,, and this inhibition might be due to the presence of active phytochemicals like withaferin, withanolides, and steroidal lactone. Kharel et al. studied the antimicrobial effect of these isolated phytoconstituents and found them active against many bacteria in the concentration equal to or higher than 2 mg/mL. Moreover, they found that the inhibition is increased with the concentration-dependent manner. At increasing concentrations, methanolic extract of Datura innoxia showed increasing S. aureus inhibition. Methanolic, ethanolic, n-hexane and acetone extracts of Artemisia absinthium and three widely used antibiotics were tested against S. aureus. The methanolic extract has shown maximum inhibition zone (13.66 mm) [Table 4]; however, the bacterium showed resistance to erythromycin. Myrcene, trans-thujone, trans-sabinyl acetate, chamazulene, nuciferolbutanoate, nuciferol propionate, caryophyllene oxide, monoterpene, esters, and sesquiterpenes (anti-S. aureus effect with MIC 0.10 mg/mL) are the main chemical components of Artemisia absinthium oil, which were tested in different biological activities and showed potential antibacterial effect against S. aureus,. Similarly, different extracts of Cichorium intybus was investigated against S. aureus, of which n-hexane showed good inhibition while chloroform did not show any inhibition at 20 mg/mL concentration. The secondary metabolites like saponins, alkaloids, flavonoids, tannins and triterpenoids have been isolated from this plant, which carries antibacterial properties. The ethanolic extract of Calendula arvensis showed 20 mm inhibition at 10 mg/mL concentration against S. aureus. This activity may be due to the presence of sesquiterpene, glycosides, triterpene, saponin, and arvensoside A, B, C, as well as calandulasoids. According to a study, saponins extracted from Medicago species showed antibacterial activity against S. aureus. Similarly, another study proved that some triterpenes inhibited the growth of Gram positive and negative bacteria. Chloroform extracts of Malva neglecta (M. neglecta) have maximum inhibition against S. aureus, which might be due to phytochemicals like flavonoids, hydroxyl cinnamic acids and phenol. According to different studies, these phytochemicals have potentially shown antibacterial, antifungal and antiviral activities,. Walter et al. studied the methanolic extract of M. sylvestris against S. aureus and compared the result with antibiotic ampicillin. The methanolic extract showed 3.1 and 2.1 mm inhibitory zones at a rate of 15 and 10 mg/mL, respectively. Several phytochemicals like malvone, terpenoids and phytoalexins have been isolated from M. sylvestris. Likewise, methanolic extracts of Althaea officinalis at concentrations of 15 and 10 mg/ mL have shown 2.7 mm and 2.3 mm inhibition zones, respectively against S. aureus. However, in Iranian Althaea officinalis, the n-hexane extracts of flowers and roots produced 18.4 and 16.8 mm inhibition zone in S. aureus. This inhibitory effect may due to chemical compounds like dihydrokaempferol 4'-O-glucoside, tiliroside, hypolaetin 8-O-gentiobioside, n-hexacos-2-enyl-1,5-olide (altheahexacosanyl lactone), 2p-hydroxycalamene (altheacalamene) and 5,6-dihydroxycoumarin-5-dodecanoate-6p-D-glucopyranoside (altheacoumarin glucoside). Stem and leaves extracts of Calotropis procera were reportedly tested in-vitro against S. aureus. The result showed that the butanolic extract of both stem and leaves have produced inhibitory zones 8.5 mm and 7.2 mm, respectively at 4 mg/mL. Calotropis procera contains phytochemicals like alkaloids, flavonoids, tannins, steroids, triterpenoids and saponins. Various kinds of leaves extracts of Carissa spinarum (C. spinarum) were also tested against S. aureus. All these extracts were found to be inactive except 20 mg/mL of chloroform extract dissolved in DMSO showed 10.2 mm anti-S. aureus inhibition. According to Ahmed et al., ethanolic extracts of leaves and fruits of C. spinarum (3 mg/mL concentrations each) showed anti-S. aureus inhibitory effect of 23.1 mm and 19.3 mm, respectively. Similarly in the same study, ethanolic extracts of leaves and fruits of C. spinarum (3 mg/mL concentrations each) showed inhibitory effects in the range between 14.5 to 18.5 mm against four different methicillin-resistant S. aureus (MRSA). Sahreen et al. have isolated flavonoids, orientin, isoquercetin, myricetin, and apigenin belongs to phenols from this plant, which may be responsible for anti-S. aureus activity. Shinwari et al. studied the antibacterial effects of alcoholic, n-hexane and acetone extracts of Punica granatum, and these results were compared with widely used antibiotics. All these extracts show strong inhibitory effect except n-hexane. Methanolic extract dissolved in DMSO at 50 mg/mL has shown optimum anti-S. aureus inhibition zone (20 mm) in comparison to gentamicin antibiotic (24 mm). Similarly, among the three tested antibiotics, S. aureus showed resistance to erythromycin. Various extracts of Woodfordia fruticosa were reportedly tested against S. aureus, of which ethanolic extract came up with maximum inhibitory effect (17 mm). These results are comparable to the tested antibiotics, in which gentamicin showed highest inhibition (24 mm) against S. aureus. The phytochemical study showed that the oil of Woodfordia fruticosa is a rich source of α-pinene, β-selinene, 2,6-dimethyl-1, 3, 5, 7-octatetraene, β-caryophyllene, γ-curcumene, germacrene D-caryophylleneoxide compounds belongs to class momoterpenes. Compound α-pinene extracted from Iranian Stachys schtschegleevii showed inhibition zone of 7 mm against S. aureus at 10 mg/mL concentration. Different leaf extracts such as petroleum ether, chloroform, ethanol and methanol of two plants Viburnum grandiflorum (V. grandiflorum) and Viburnum nervosum were reportedly tested against S. aureus. 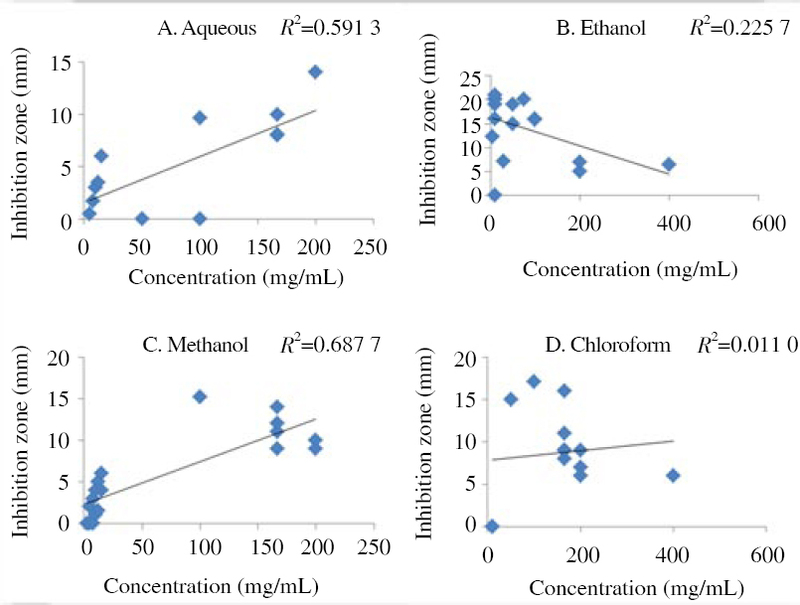 Petroleum ether and chloroform extract of both plants did not show any inhibition zone while ethanol showed (21.5 and 21.33 mm) inhibition and methanol (26.33 and 19.16 mm) inhibition at 10 mg/ mL concentration, respectively. These results are comparable to the anti-S. aureus activities produced by antibiotics erythrocin (28.17 mm) and ciprofloxacin (24.33 mm). Overall, the reported findings are in line with the study conducted by Uddin et al., who found 20 mm inhibition zone in S. aureus being produced by the methanolic extract of V. grandiflorum stem. V. grandiflorum holds various phytochemical constituents that belong to class steroids, terpenoids, anthraquinones, saponins and glycosides. Further chemical investigations of these phytochemicals and their detailed in-vitro activities would help in the identification of active compounds and mechanism of action against S. aureus. Alcoholic, n-hexane and acetone extract of Acacia nilotica were compared with the commonly used antibiotics. All the extracts showed potential antibacterial activities except n-hexane extract. Similarly, among the three tested antibiotics, S. aureus showed resistance to erythromycin. Niloticane isolated from Acacia nilotica is responsible for its anti-S. aureus activity with MIC values recorded as 8 μg/mL. Mahesh and Satish tested the methanolic extract of Acacia nilotica leaves (10 mg/mL concentration), which produced 15 mm inhibition against S. aureus. The methanolic extract of Glycyrrhiza glabra tested at different concentrations has shown an increasing trend in S. aureus inhibition at rising methanol concentrations. In another study, Ateş and Turgay found 7 mm/20 μL inhibition against S. aureus by the alcohol, ethyl acetate, acetone and chloroform extracts of Glycyrrhiza glabra. Different extracts of Aesculus indica were reportedly tested for in-vitro activity against S. aureus. Crude extract was the most active with an inhibition zone of 14.5 mm among all the tested extracts. The n-hexane fraction did not show any activity, while chloroform and aqueous showed the same activity, i.e., 13 mm inhibition. Moreover, ethyl acetate and methanol showed inhibition zones of 12 and 11 mm, respectively. Flavonoids, terpenoids, and steroids isolated from Aesculus indica reportedly carry diverse pharmacological properties. Terpenoids isolated from Aesculus indica have shown potent inhibitory effect against S. aureus with MIC values ranges from 4–256 μg/mL. Flavonoids and tannin has also been tested for anti-S. aureus activity,. Ethanolic extracts of Dodonaea viscosa leaves (10 mg/mL) and aerial parts (3.2 mg/mL) showed 16 and 12 mm inhibition, respectively in S. aureus; however, aqueous extract was found inactive,. Tannins, saponins, terpenoids and flavonoids isolated phytochemicals may be supportive in increasing the antibacterial effect of this plant. Four kaempferol methyl ethers were isolated from the leaves extracts of South African Dodonaea viscose. These compounds are (i) 4'-O-methylkaempferol (3, 5, 7-trihydroxy-4'-methoxyflavone), (ii) 5, 7, 4'-trihydroxy-3,6-dimethoxyflavone, (iii) 5,7-dihydroxy-3, 6, 4'-trimethoxyflavone (santin), (iv) 5-hydroxyl-3, 7, 4'-trimethoxyflavone, and (v) 3,4', 5, 7-tetrahydroxyflavone (kaempferol). Among all these compounds, iii and v were observed most active at a rate of 63 μg/mL concentrations in producing MIC in S. aureus. However, testing the effective and toxicity doses of these compounds need to be carried out. Species belong to genus Elaeagnus are important medicinal plants being commonly used by the local people for various human infectious diseases including the one caused by S. aureus. Elaeagnus angustifolia (E. angustifolia) extracts were tested against S. aureus and it was found that ethyl acetate extract has shown maximum inhibition (25 mm), methanol showed minimum inhibition (15 mm), while chloroform showed no inhibition activity at each 1 mg/ mL concentrations dissolved in DMSO. The phytochemicals of E. angustifolia are acid esters including phenol, rutin, gallic acid, chlorogenic acid, hydroxybenzoic acids, hydroxycinnamic acids and hydroxybenzoic acids (strong anti-S. aureus inhibition at 500 μg/ mL) can have better antibacterial effect than extracts. Similarly, different extracts of flower, leaves and berry of E. umbellate were reportedly tested in-vitro against S. aureus. Out of these, ether extract of flower and aqueous extract of berry possesses highest inhibition zones, i.e., 14 mm each at 200 mg/mL concentrations. Rutin, gallic acid, chlorogenic acid, hydroxybenzoic acids and hydroxycinnamic acids are the reported chemical compounds isolated from plants. These in-vitro activities support the validation of ethnomedicinal uses of both Elaeagnus species against S. aureus diseases. Different extracts of berries and leaves of Hippophae rhamnoides have shown good activity with increasing concentration and effective at very low concentration against S. aureus. A number of plant extracts of families other than listed above have also reportedly shown good anti-S. aureus activities. As an example, methanolic extract of root of Asparagus racemosus (Asparagaceae) has shown significant antibacterial effect with increasing concentration. Gobicusin A, asparacosin A and muzanzagenin are steroidal saponins compounds being isolated from Asparagus racemosus were tested for anti-S. aureus effect and showed 0.05 mg/mL MIC each, while isoagatharesinol showed slightly lower MIC value of 0.12 mg/mL in comparison to the antibiotic streptomycin by showing 0.01 mg/mL MIC. In a study, it was revealed that muzanzagenin isolated from Asparagus africanus exhibit anti-leishmanial and anti-plasmodial activity. Hence, all of these compounds (asparacosin A, gobicusin A, isoagatharesinol, and muzanzagenin) have the potential biological activities and may further be evaluated against different strains of S. aureus and other bacteria. Different extracts of leaves of Calophyllum inophyllum (Clusiaceae) and isolated compounds were tested for in-vitro activity against S. aureus and found that all the extracts and compounds have shown good inhibitory effect except butanol and canophyllic acid. Friedelin and inophynone compounds belongs to terpenes group being isolated from Calophyllum inophyllum have shown 6.60 and 4.51 mm inhibition zones, respectively against S. aureus. In a study by Yasunaka et al., friedelin being isolated from Calophyllum brasiliense has shown MIC of >512 μg/mL against both methicillin-sensitive and methicillin-resistant S. aureus. Ethanolic extract of leaves of Cannabis sativa (Cannabinaceae) produced 20 mm zone of inhibition against S. aureus at 10 mg/mL. Cannabinoid, a compound isolated from Cannabis sativa and show good inhibition at 0.5–2 μg/mL,. Methanolic extract of Berberis aristata (Berberidaceae) have shown good inhibition and different classes of compounds are present in these extract are alkaloids, flavonoids, terpenoids, saponins, and glycosides. Different extracts of Aerva javanica (Amaranthaceae) have shown inhibition against S. aureus but methanolic extract show good inhibition. Various extracts of Cinnamomum verum (Lauraceae) (C. verum) including methanolic, ethanolic, n-hexane and acetone and three antibiotics were tested against S. aureus for activity. All the extracts remain inactive except n-hexane which showed 13 inhibition zone at 50 mg/mL concentration while among three antibiotics, Erythromycin did not show any inhibition against S. aureus. The isolated phytoconsitituents eugenol, monoterpenes, protocatechuic acid, urolignoside, cinnamaldehyde, benzaldehyde, and sesquiterpenes might be responsible for the antibacterial effect of this plant. C. verum is rich in essential oils (mainly cinnamaldehyde and eugenol), which can inhibit the microbial growth. A study has shown that the essential oil of C. verum exhibit a strong antibacterial activity against S. aureus mainly because of cinnamaldehyde, which is the major component of the oil (73.35%). Cinnamaldehyde is reportedly effective against a wide range of bacteria both Gram-positive and Gram-negative. Another study revealed that eugenol isolated from Syzygium aromaticum and cinnamaldehyde isolated from C. verum have shown significantly higher inhibition zones (>20 mm) against S. aureus with MIC 0.31 mg/mL,. Crude ethanolic extract of Ficus carica leaves at 10 mg/mL showed 20 mm inhibition zone against S. aureus. Leaf extract of Ficus carica had the highest total phenolic contents[(52.296±5.232) and (48.973±2.015) mg gallic acid equivalent/g of dry plant extract respectively] and flavonoids [(14.388±0.333) and (14.136±1.082) mg quercetin equivalent/g of dry plant extract]. These extracts showed bactericidal activity and moderate antifungal activity. Phytochemicals like steroids, alkaloids, furano coumarins, flavonoids (rutin, quercetin, and luteolin), coumarins, saponins and terpenes are isolated. Different fractions of rhizome and leaves of Geranium wallichianum (Geraniaceae) have been reportedly tested against S. aureus. Only methanolic (1 mg/mL) and ethyl acetate (1 mg/mL) extracts have shown anti-S. aureus activity, i.e., 14.33 and 22.33 mm, respectively, while the rest extracts have shown no antibacterial activity. β-sitosterol, β-Sitosterol-glactoside, stigmasterol, 2, 4, 6-trihydroxyethylbenzoate are some of the isolated phytochemicals from Geranium wallichianum,. Methanolic extract of Paeonia emodi (Paeoniaceae) roots showed 15 mm inhibition at 5 mg/mL concentration that may be due to the presence of paeonins A and B, and monoterpenegalactosides. Quercus floribunda (Fagaceae) is a medicinal plant that is traditionally used to treat asthma, diarrhea, and gonorrhea. Its methanolic extract at 25 mg/mL showed highest anti-S. aureus inhibition (19.8 mm). Quercetin, gallic acid, rutin and alkaloids are some of the reported phytochemicals isolated from this plant. Quercetin has reportedly shown strong anti-S. aureus activities. Phytoconstituents may exhibit different action mechanism against bacteria ranging from interference with cell membranes, loss of cellular constituents, enzymes damage, and disturbance of the genetic material. Overall, the action mechanism is considered to be damaging cytoplasmic membrane, disturbing proton motive force, electron flow, active transport mechanisms and coagulation of cell composition. Phenolics class of compounds destabilized and permeabilized cytoplasmic membrane and inhibits enzyme activity by the oxidized products, e.g., reaction of quinines with amino acids and proteins. Phenols can also inhibit the synthesis of nucleic acids of both Gram-negative and Gram-positive bacteria. Types of microorganisms, its cell membrane structure and composition are considered important in the susceptibility to antimicrobials. The passage via outer membrane in Gram-negative bacteria is dependent on the chemical nature of antimicrobial product and regulated by the occurrence of hydrophilic channels, known as porins. Phytochemical constituents of Moringa oleifera can cause enzyme inhibition in bacteria (sortase inhibitory effect), replication of DNA, action by the bacterial toxin and bacterial cell lysis. Tannins are polyphenols having the ability to restrain the proliferation of bacterial cells through blocking the essential enzymes of microbial metabolism. Saponins might act as altering the permeability of cell walls and can combine with the cell membranes to bring out certain changes in cell morphology that may lead to cell lysis. An example of herbs including tarragon and thyme contain caffeic acid that is efficient against bacteria, fungi, and viruses. Catechol and pyrogallol both are hydroxylated phenols, which are toxic to certain microorganisms. Catechol possesses two hydroxyl groups while pyrogallol contains three. The sites and number of hydroxyl groups on the phenol group are believed to add in the microbial toxicity. This is being evident when increasing hydroxylation was related to increased microbial toxicity. The toxicology of some isolated compounds and their associated plant species are being discussed in this sub-section. Acacia nilotica is one of the beneficial medicinal plants; however, its acute toxicity in rats has been proved. Eight percent of the extract was given to the animal for 4 weeks and a significant reduction in body weight, hemoglobin and cholesterol were observed. Thus, the toxicity of the plant may be due to its frequently occurring compound such as niloticane. Furthermore, eugenol is a compound whose amount is approximately 86% in the essential oils of C. verum leaves. According to the U.S. Food and Drug Administration, this compound is considered safe. However, it has severe toxic effects on animals and human beings. As an example, it killed wet human dental tissues, broke DNA in human VH10 fibroblasts and caused cytotoxicity in malignant HepG2 hepatoma cells, malignant Caco-2 colon cells, and nonmalignant human VH10 fibroblasts. Similarly, the compound decreased body weight with increased salivation, and abnormal breathing patterns in rats. Similarly, asparacosine A, a compound belonging to the plant species A. racemosus, has reportedly produced cytotoxicity in different human cells in cultures including Lu1, Col2, LNCaP, HUVEC, and KB at the IC50 values between 10.7 μg/mL to>20 μg/mL. Additionally, the plant extract caused teratological disorders i.e. desorption of fetuses and gross malformations in rats at 100 mg/kg/day for 60 days. Thus, the toxicity of Asparagus racemosus might be due to asparacosine A and some other compounds such asisoagatharesinol, gobicusin A and muzanzagenin. Furthermore, altheahexacosanyl lactone is the frequently occurring compound in Althaea officinalis. According to a study, 10 g of the Althaea officinalis extract caused cytotoxicity and changes in blood biochemical parameters of common carp (Cyprinus carpio). Likewise, friedelin and inophynone, compounds of the species Calophyllum inophyllum, might also be harmful for animals as the unrefined oil of the plant has been proved for its toxic effects. There was a significant difference in the plasma cholesterol levels of the rats fed with Calophyllum inophyllum oil when compared to the control. Hence, more studies to be undertaken in order to understand the toxicological nature of plant species and their compounds in the processes of identification of safe drugs. The review collects the traditional uses of medicinal plants against various diseases caused by S. aureus. The study also reviewed the in-vitro anti-S. aureus activities of various extracts of the reported medicinal plants along the active phytochemicals possessed by these plants. Overall, the in-vitro reports of different studies support the traditional uses of medicinal plants in the world in general and Pakistan in particular for the treatment of different ailments caused by S. aureus. However, there are certain lope holes in the previous studies, which are needed to be addressed for a complete set of knowledge on this topic. As an example in traditional uses, there is limited data available on doses range of medicinal plant, the period of intake and recovery against a certain disease caused by S. aureus. This kind of information is extremely important for the comparison of ethnomedicinal data with pharmacological and toxicological dataset of a plant species. Almost all the discussed families showed good inhibition against the S. aureus. However, the frequently used anti-S. aureus families were Lamiaceae and Solanaceae. One of the possible reasons is the availability of a high number of plant species in these two families. Another reason could be higher ethnopharmacological efficacy of the members of these two families. 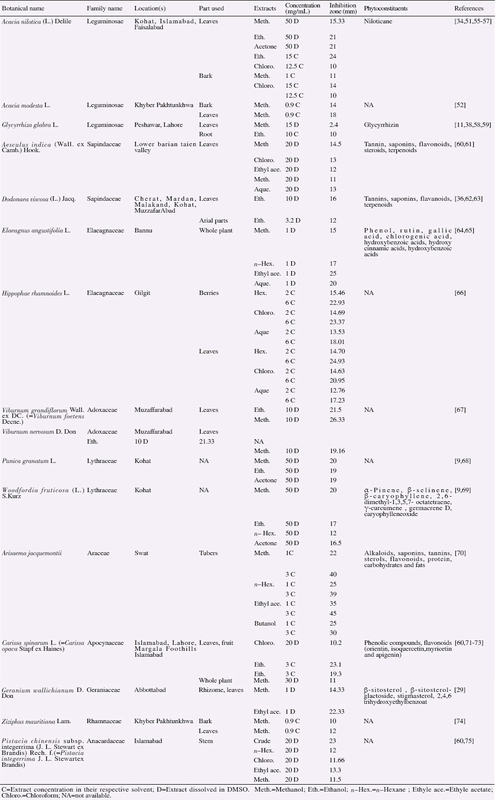 Therefore, more ehtnopharmacological data on the plant species in these families should be explored for novel results. Although most of the plants have shown good inhibition zone against S. aureus but there is little data on their MIC and MBC values, so there is need to find these values. Species such as A. racemosus, E. angustifolia, Teucrium stocksianum, Geranium wallichianum, Salvia cabulica, Quercus floribunda, Carissa spinarum and Cistanche tubulosa may be given preference for further investigation related to anti-S. aureus activities. Plant families including Asparagaceae, Elaeagnaceae, Lamiaceae, Geraniaceae, Fagaceae, Apocynaceae and Orobanchaceae should be subjected to phytochemical and pharmacological investigations against S. aureus. In Pakistan, methanol and ethanol solvent is mostly preferred for plants extraction process, which might be due to its significant results against S. aureus. Moreover, leaves are major plant part used in extraction and show good inhibition. Similarly, phytochemical classes like alkaloids, flavonoids, saponins and tannins should also be evaluated for anti-S. aureus activities. Moreover, majority of the plants has been observed with less number of pure phytochemical compounds oriented anti-S. aureus activities. At present, only some of the isolated compounds from the reported plants such as altheahexacosanyl lactone, cinnamaldehyde, niloticane, gobicusin A, asparacosin A, muzanzagenin, isoagatharesinol, friedelin and inophynone, eugenol have shown anti-S. aureus activities. These compounds should be carried forward for further investigations including, toxicology, in-vitro, in-vivo and mechanism of actions against S. aureus. Other unexplored plants should also be investigated to the compounds level for anti-S. aureus activities. This is the essential part of the pharmacological activities, which will lead us to the evaluation of those phytoconstituents that are still unknown and could serve as potent antimicrobial agents. Such antibacterial agent from natural sources could be more effective against bacterial pathogens and will help to minimize the adverse effects of synthetic drugs and would provide a base for the pharmaceutical industries. Additionally, isolated phytochemical compounds may also be subjected to the development of several derivates, which can be tested in-vitro and in-vivo against S. aureus. Another important aspect reportedly missing is related to the documented medicinal plants in-vivo studies on different animal models, which should also be considered in future studies. Clinical trials should also be taken into account along with absorption and metabolism of compounds that would allow in calculating the amount of compounds reaches the site to be treated. Mechanism of action of the plant extracts or isolated compounds on S. aureus would also bring the ethnopharmacological studies a bit further. Moreover, there is a dire need for testing the toxicities of the documented plants at various levels. The authors are thankful to all those researchers who have worked on the topics related to this study and provided us with an opportunity to write this review article. Shinwari ZK. Medicinal plants research in Pakistan. J Med Plants Res 2010; 4: 161-176. Todd JK. Staphylococcal infections. Pediatr Rev 2005; 26(12): 438. Stefani S, Chung DR, Lindsay JA, Friedrich AW, Kearns AM, Westh H, et al. Methicillin-resistant Staphylococcus aureus (MRSA): Global epidemiology and harmonisation of typing methods. Int J Antimicrob Agent 2012; 39(4): 273-282. Ullah A, Qasim M, Rahman H, Khan J, Haroon M, Muhammad N, et al. High frequency of methicillin-resistant Staphylococcus aureus in Peshawar region of Pakistan. Spring Plus 2016; 5(1): 1-6. Ahmad MK, Asrar A. Prevalence of methicillin resistant Staphylococcus aureus in pyogenic community and hospital acquired skin and soft tissues infections. J Pak Med Assoc 2014; 64(8): 892-895. Alan J, Magill MD, Fidsa FACP, Ryan ET. Hunter's tropical medicine and emerging infectious disease. 9th ed. London: Elsevier Health Sciences; 2012. Missouri Botanical Garden, Harvard University Herbaria. 'eFloras (2008). [Online]. Available from: http://www.efloras.org. Accessed on March 12, 2015. The Plant List 2013. Version 1.1. [Online]. Available from: http://www.theplantlist.org. Accessed on January 1, 2013. Shinwari ZK, Salima M, Faisal R, Huda S, Asrar M. Biological screening of indigenous knowledge based plants used in diarrheal treatment. Pak J Bot 2013; 45(4): 1375-1382. Ali H, Qaiser M. The ethnobotany of Chitral valley, Pakistan with particular reference to medicinal plants. Pak J Bot 2009; 41(4): 2009-2041. Walter C, Shinwari ZK, Afzal I, Malik RN. Antibacterial activity in herbal products used in Pakistan. Pak J Bot 2011; 43: 155-162. Mehreen A, Waheed M, Liaqat I, Arshad N. Phytochemical, antimicrobial and toxicological evaluation of traditional herbs used to treat sore throat. Bio Med Res Inter 2016; 2016: 8503426. Bibi Z. Animicrobial activity of Calotrpis procera. Kohat: KUST; 2013. Nadeem M, Shinwari ZK, Qaiser M. Screening of folk remedies by genus Artemisia based on ethnomedicinal surveys and traditional knowledge of native communities of Pakistan. Pak J Bot 2013; 45: 111-117. Uddin M, Ghufran MA, Idrees M, Irshad M, Jabeen S. Antibacterial activity of methanolic root extract of Asparagus racemosus. J Pub Health Biol Sci 2012; 1(2): 32-35. Aslam F, Rehman KU, Asghar M, Sarwar M. Antibacterial activity of various phytoconstituents of Neem. Pak J Agric Sci 2009; 46(3): 209-213. Arora DI, Rani, Sharma A. A review on phytochemistry and ethnopharmacological aspects of genus Calendula. Pharmacog Rev 2013; 7(14): 179-187. Ali MS, Mahmud S, Perveen S, Riazwani GH, Ahmad VU. Screening for the antimicrobial properties of the leaves of Calophyllum inophyllum Linn. (Guttiferae). J Chem Soc Pak 1999; 21(2): 175-178. Haq F, Ahmad H, Alam, M. Traditional uses of medicinal plants of Nandiar Khuwarr catchment (District Battagram), Pakistan. J Med Plant Res 2011; 5(1): 39-48. Adnan M, Ullah I, Tariq A, Murad W, Azizullah A, Khan AL, et al. Ethnomedicine use in the war affected region of northwest Pakistan. J Ethnobiol Ethnomed 2014; 10: 16. Murad W, Azizullah A, Adnan M, Tariq A, Khan KU, Waheed S, et al. Ethnobotanical assessment of plant resources of Banda Daud Shah, District Karak, Pakistan. J Ethnobiol Ethnomed 2013; 9(77): I-10. Farooqui A, Khan A, Borghetto I, Kazmi SU, Rubina S, Paglietti B. Synergistic antimicrobial activity of Camellia sinensis and Juglans regia against multidrug-resistant bacteria. PLoS One 2015; 10(2): 1-14. Zakir M, Sultan KB, Khan H, Ullah I, Khan MA, Fazal H, et al. Antimicrobial activity of different tea varieties available in Pakistan. Pak J Pharm Sci 2015; 28(6): 2091-2094. Qureshi RU, Bhatti RG, Memon RA. Ethnomedicinal uses of herbs from northern part of Nara desert, Pakistan. Pak J Bot 2010; 42(2): 839-851. Tariq A, Mussarat S, Adnan M. Review on ethnomedicinal, phytochemical and pharmacological evidence of Himalayan anticancer plants. J Ethnopharmacol 2015; 164: 96-119. Sabir MS, Ahmad DS, Hussain IM, Tahir KM. Antibacterial activity of Elaeagnus umbellata (Thunb.) a medicinal plant from Pakistan. Saudi Med J 2007; 28(2): 259-263. Subhan F, Islam T, Asif M, Rehman H. Exploration of medicinal plant activity against pathogenic bacteria. Kohat: KUST; 2013. Hussain SZ, Malik RN, Javaid M, Bibi S. Ethonobotanical properties and uses of medicinal plants of Morgah biodiversity park, Rawalpindi. Pak J Bot 2008; 40(5): 1897-1911. Ismail M, Hussain J, Khan AU, Khan AL, Ali L, Khan FU, et al. Antibacterial, antifungal, cytotoxic, phytotoxic, insecticidal and enzyme inhibitory activities of Geranium wallichianum. Evid Based Comple Alter Med 2012; 2012: 305906. Musa DA, Nwodo FOC, Ojogbane E. Phytochemical, antibacterial and toxicity studies of the aqueous extract of Euclayptus carmildulensis Dehnh. Asian J Plant Sci Res 2011; 1(3): 1-10. Tareen RB, Bibi T, Khan MA, Ahmad M, Zafar M. Indigenous knowledge of folk medicine by the women of Kalat and Khuzdar regions of Balochistan, Pakistan. Pak J Bot 2010; 42(3): 1465-1485. Rehman HU, Yasin KA, Choudhary MA, Khaliq N, Rahman AU, Choudhary MI, et al. Studies on the chemical constituents of Phyllanthus emblica. Nat Prod Res 2007; 21(9): 775-781. Malik F, Hussain S, Mirza T, Hameed A, Ahmad S, Riaz H, et al. Screening for antimicrobial activity of thirty three medicinal plants used in the traditional system of medicine in Pakistan. J Med Plant Res 2011; 5(14): 3052-3060. Mallavadhani UV, Mahapatra A, Jamil K, Reddy PS. Antimicrobial activity of some pentacyclic triterpenes and their synthesized 3-O- lipophilic chains. Biol Pharm Bull 2004; 27(10): 1576-1579. Wang T, Jonsdottir R, Olafsdottir G. Total phenolic compounds, radical scavenging and metal chelation of extracts from Icelandic seaweeds. Food Chem 2009; 116(1): 240-248. Mkaddem M, Bouajila J, Ennajar M, Lebrihi A, Mathieu F, Romdhane A. Chemical composition and antimicrobial and antioxidant activities of Mentha longifolia L. and viridis essential oils. J Food Sci 2009; 74(7): 358-363. Hazrat A, Nisar M, Shah J, Ahmad S. Ethnobotanical study of some elite plants belonging to Dir, Kohistan valley, Khyber Pakhtunkhwa, Pakistan. Pak J Bot 2011; 43(2): 787-795. Iqbal Z, Gul S, Haq IU, Munawar A, Ahmad A, Amin F, et al. Antibacterial and antifungal activity of Mentha longifolia Mirkalan village of Nizampur region Nowshehra district of KPK, Pakistan. J Entomol Zool Stud 2017; 5: 318-321. Anwar N, Salik S, Ahmad D. Antibacterial activity of Otostegia limbata. Int J Agric Biol 2009; 11: 647-650. Ahmad VU, Khan A, Farooq U, Kousar F, Khan SS, Nawaz SA, et al. Three new cholinesterase-inhibiting cis-clerodane diterpenoids from Otostegia limbata. Chem Pharm Bull 2005; 53(4): 378-3781. Rashid R, Mukhtar F, Niaz MM. Biological screening of Salvia cabulica. Pak J Bot 2009; 41(3): 1453-1462. Wazir F, Hussain G. Phytochemical investigation and biological evaluation of Teucrium stocksianum. Kohat: KUST; 2012. Mahmood A, Mahmood A, Mahmood M. In vitro biological activities of most common medicinal plants of family Solanaceae. World Appl Sci J 2012; 17(8): 1026-1032. Tandon C, Mathur P, Sen M, Kanojiya S. Identification of an antibacterial Withanolide (Dinoxin B) from leaf of Datura inoxia Mill. Int J Phytomed 2016; 8(1): 1-12. Hussain F, Kalim M, Ali H, Ali T, Khan M, Xiao S, et al. Antibacterial activities of methanolic extracts of Datura inoxia. PSM Microbiol 2017; 1: 33-35. Abbass K, Niaz U, Hussain T, Saeed MA, Javaid Z, Idrees A, et al. Antimicrobial activity of fruits of Solanum nigrum and Solanum xanthocarpum. Acta Polon Pharm Drug Res 2014; 71: 415-421. Javed A. Evaluation of ethanolic crude extracts of Azadirachta indica and Solanum nigrum efficacy for dermal wounds healing. J Inter Acad Res Multidiscip 2017; 5: 1-10. Ghani MU, Farooq MU, Khan MTJ. Phytochemical investigations and evaluation of antibacterial and irritant potential of different extracts of whole plant of Solanum xanthocarpum Schrad and Wendl. J Chin Chem Soc 2010; 57: 1257-1262. Singh OM, Singh TP. Phytochemistry of Solanum xanthocarpum: An amazing traditional healer. J Sci Ind Res 2010; 69: 732-740. Matsuda H, Murakami T, Kishi A, Yoshikawa M. Structures of Withanosides I, II, III, IV, V, VI, and VII, new withanolide glycosides, from the roots of Indian Withania somnifera Dunal. and inhibitory activity for tachyphylaxis to clonidine in isolated Guinea-Pig Ileum. Bio Org Med Chem 2001; 9: 1499-1507. Ali S, Ali K, Hussain Z, Khan MS, Khan WM, Wali S, et al. Phytochemical screening and antimicrobial activity of selected medicinal plant species. Pure Appl Biol 2017; 6: 418-425. Khan WM, Ali S, Khan MS, Akhtar N, Ali K, Khan H. Investigation of antimicrobial activity of some selected weed species. Pak J Weed Sci Res 2016; 22: 587-593. Lutz LD, Alviano DS, Alviano CS, Kolodziejczyk PP. Screening of chemical composition, antimicrobial and antioxidant activities of Artemisia essential oils. Phytochem 2008; 69: 1732-1738. Babadjamiay RC, Faure R, Boukef K, Balansard GE, Vidal E. Arvensoside A and B, triterpenoid saponins from Calendula arvensis. Phytochem 1987; 26(6): 1785-1788. Uddin G, Alam M, Siddiqui BS, Rauf A. Preliminary phytochemical profile and antibacterial evaluation of Viburnum grandiflorum Wall. Glob J Pharm 2013; 7(2): 133-137. Shakoor A, Zaib G. Comparative antimicrobial activity of Acacia nilotica L. leaves extracts against pathogenic bacteria and fungi. Sindhol Stud 2015; 3: 16-23. Rahman AU, Shakoor A, Zaib G, Mumtaz AS, Ihtesham Y, Napar AA. Comparative antimicrobial activity of Acacia nilotica L. leaves extracts against pathogenic bacteria and fungi. J Med Plant Res 2014; 8(29): 975982. Sharma V, Agrawal RC. Glycyrrhiza glabra- A plant for the future. Mintage J Pharm Med Sci 2013; 2(3): 15-20. Sedighinia F, Afshar AS, Soleimanpour S, Zarif R, Asili J, Ghazvini K. Antibacterial activity of Glycyrrhiza glabra against oral pathogens: An in vitro study. Avicenna J Phytomed 2012; 2(3): 118-124. Bibi Y, Nisa S, Chaudhary FM, Zia M. Antibacterial activity of some selected medicinal plants of Pakistan. Comple Altern Med 2011; 11(52): 1-7. Kaur L, Joseph L, George M. Phytochemical analysis of leaf extract of Aesculus indica. Inter J Pharm Sci 2011; 3(5): 232-234. Khurram M, Khan MI, Hameed A, Abbas N, Qayum A. Antibacterial activities of Dodonaea viscosa using contact bioautography technique. Molecule 2009; 14: 1332-1341. Prakash NKU, Selvi CR, Sasikala V, Dhanalakshmi S, Prakash SBU. Phytochemistry and bio-efficacy of a weed, Dodonaea viscosa. Int J Pharm Pharm. Sci 2012; 4(2): 509-512. Khan SU. Phytochemical and biological evaluation of Elaeagnus angustifolia. Kohat: KUST; 2013. Adnan M, Bibi R, Azizullah A, Andaleeb R, Mussarat S, Tariq A, et al. Ethnomedicinal plants used against common digestive problems. Afri J Trad Comple Altern Med 2015; 12(5): 99-117. Qadir MI, Abbas K, Younus A, Shaikh RS. Antibacterial activity of sea buckthorn (Hippophae rhamnoides L.) against methicillin resistant Staphylococcus aureus (MRSA). Pak J Pharm Sci 2016; 29: 1705-1707. Awan ZI, Rehman HU, Ahmed MN, Yasin KN, Minhas FA, Zubair M. Antibacterial screening of leaves of wild Viburnum nervosum and Viburnum foetens of Azad Kashmir. Int J Pharm Sci Invent 2013; 2(6): 2226. Nandagopal S, Kumari BDR. Phytochemical and antibacterial studies of Chicory (Cichorium intybus L.) - A Multipurpose medicinal plant. Adv Biol Res 2007; 1(1-2): 17-21. Kaur R, Kaur H. The antimicrobial activity of essential oil and plant extracts of Woodfordia fruticosa. Arch Appl Sci Res 2010; 2(1): 302-309. Iqbal M, Bakht J, Shafi M. Phytochemical screening and antibacterial activity of different solvent extracted samples of Arisaema jacquemontii. Pak J Pharm Sci 2018; 31: 75-81. Ahmad A. Antimicrobial, antioxidative and photochemical evaluation of Cichorium intybus and related species. KUST Kohat Pak; 2010. Sahreen S, Khan MR, Khan RA, Shah NA. Estimation of flavonoids, antimicrobial, antitumor and anticancer activity of Carissa opaca fruits. Comple Altern Med 2013; 13(372): 1-7. Zulqarnain, Rahim A, Ahmad K, Ullah F, Ullah H, Nishan U. In vitro antibacterial activity of selected medicinal plants from lower Himalayas. Pak J Pharm Sci 2015; 28: 581-587. Zehra A, Naqvi SBS, Ali SQ. In vitro evaluation of antimicrobial effect of extracts of medicinal plant's leaves. J Med Microb Diagn 2016; 5: 3. Bharathirajan R, Prakash M. Analysis of IR, NMR and in vitro antibacterial potency of Pistacia integerrima against 6 clinically isolated multidrug resistant bacteria. Int J Curr Microbiol App Sci 2015; 4(6): 1741190. Aliero AA, Afolayan AJ. Antimicrobial activity of Solanum tomentosum. Afri J Biotechnol 2006; 5(4): 369-372. Nikkon F, Saud ZA, Rehman MH, Haque ME. In vitro antimicrobial activity of the compound isolated from chloroform extract of Moringa oleifera Lam. Pak J Biol Sci 2003; 6 (22): 1888-1890. Wang L, Weller CL. Recent advances in extraction of nutraceuticals from plants. Trends Food Sc Tech 2006; 17: 300-312. Bahmani M, Saki K, Shahsavari S, Kopaei RM, Sepahvand R, Adineh A. Identification of medicinal plants effective in infectious diseases in Urmia, northwest of Iran. Asian Pac J Trop Biomed 2015; 5(10): 858-864. Vilas MA. Science against microbial pathogens: Communicating current research and technological advances. In: Steinka I, Kukulowicz A, editors. Effects of selected plants on the survival of Staphylococcus aureus. 3'd ed. Spain: Formatex Microbiol Series; 2011, p. 1186-1194. Rahman SU, Awan ZUR, Khan AU, Shah AH, Rahman A, Gul I. Antibacterial potential of Skemmia laureola methanolic extract. Glob Adv Res J Microbiol 2012; 1(6): 90-93. Aliberti S, Reyes LF, Faverio P, Sotgiu G, Dore S, Rodriguez AH, et al. Global initiative for meticillin-resistant Staphylococcus aureus pneumonia (GLIMP): An international, observational cohort study. Lancet Infect Dis 2016; 16(12): 1364-1376. Pantosti A, Sanchini A, Monaco M. Mechanisms of antibiotic resistance in Staphylococcus aureus. Food Microbiol 2007; 2(3): 323-334. Fathiazad F, Hamedeyazdan S. A review on Hyssopus officinalis L. composition and biological activities. Afr J Pharm Pharmacol 2011; 5(17): 1959-1966. Lee JY, Kim YS, Shin DH. Antimicrobial synergistic effect of linolenic acid and monoglyceride against Bacillus cereus and Staphylococcus aureus. J Agric Food Chem 2002; 50(7): 2193-2199. Kharel P, Manandhar M, Kalauni SK, Awale S, Baral J. Isolation, identification and antimicrobial activity of a withanolide [WS-1] from the roots of Withania somnífera. Nepal J Sci Tech 2011; 12: 179-186. Abad MJ, Bedoya LM, Apaza L, Bermejo P. The Artemisia L. genus: A review of bioactive essential oils. Molecule 2012;17: 2542-2566. Avato P, Bucci1 R, Tava A, Vitali C, Rosato A, Bialy Z, et al. Antimicrobial activity of saponins from Medicago sp. Structure-activity relationship. Phytother Res 2006; 20: 454-457. Imtiaz B, Fozia, Waheed A, Rehman A, Ullah H, Iqbal H, et al. Antimicrobial activity of Malva neglecta and Nasturtium microphyllum. Inter J Res Ayur Pharm 2012; 3(6): 808-810. Dalar A, Turker M, Konczak I. Antioxidant capacity and phenolic constituents of Malva neglecta Wall. and Plantago lanceolata L. from eastern Anatolia region of Turkey. J Herb Med 2012; 2: 42-51. Cushnie TPT, Lamb AJ. Antimicrobial activity of flavonoids. Inter J Antimicrob Agent 2005; 26(5): 343-356. Vaquero MJR, Alberto MR, Nadra MCM. Antibacterial effect of phenolic compounds from different wines. Food Contr 2007; 18(2): 93-101. Veshkurova O, Golubenko Z, Pshenichnov E, Arzanova I, Uzbekov V, Sultanova E, et al. Malvone A, a phytoalexin found in Malva sylvestris (Malvaceae). Phytochem 2006; 67: 2376-2379. Valiei M, Shafaghat A, Salimi F. Chemical composition and antimicrobial activity of the flower and root hexane extracts of Althaea officinalis in northwest Iran. J Med Plants Res 2011; 5(32): 6972-6976. Gudej J, Bleganowska ML. Chromatographic investigations of flavonoid compounds in the leaves and flowers of some species of the genus Althaea. Chromatograph 1990; 30: 333-336. Hassan SW, Bilbis FL, Lada MJ, Umar RA, Dangoggo SM. Evaluation of antifungal activity and phytochemical analysis of leaves, roots and stem barks of Calotropis procera, (Asclepiadaceae). Pak J Biol Sci 2006; 9(4): 2624-2629. Ahmed D, Waheed A, Chaudhary MA, Khan SR, Hannan A, Barkaat M. Nutritional and antimicrobial studies on leaves and fruit of Carissa opaca stapf ex Haines. Elect J Envi Agric Food Chem 2010; 9(10): 1631-1640. Sonboli A, Salehi P, Ebrahimi SN. Essential oil composition and antibacterial activity of the leaves of Stachys schtschegleevii from Iran. Chem Nat Compd 2005; 41(2): 171-174. Eldeen IMS, Van HFR, Staden JV. In vitro biological activities of niloticane, a new bioactive cassane diterpene from the bark of Acacia nilotica sub sp. kraussiana. J Ethnopharmacol 2010; 128: 555-560. Mahesh B, Satish S. Antimicrobial activity of some important medicinal plant against plant and human pathogens. World J Agr Sci 2008; 4(5): 839-843. Ate DA, Turgay O. Antimicrobial activities of various medicinal and commercial plant extracts. Turk J Biol 2003; 27(3): 157-162. Rahman MM, Garvey M, Piddock LJV, Gibbons S. Antibacterial terpenes from the oleo-resin of Commiphora molmol (Engl.). Phytother Res 2008; 22(10): 1356-1360. Alcaraz LE, Blanco SE, Puig ON, Tomas F, Ferretti FH. Antibacterial activity of flavonoids against methicillin-resistant Staphylococcus aureus strains. J Theor Biol 2000; 205(2): 231-240. Min BR, Pinchak WE, Merkel R, Walker S, Tomita G, Anderson RC. Comparative antimicrobial activity of tannin extracts from perennial plants on mastitis pathogens. Sci Res Essay 2008; 3(2): 66-73. Teffo LS, Aderogba MA, Eloff JN. Antibacterial and antioxidant activities of four kaempferol methyl ethers isolated from Dodonaea viscosa Jacq.var. angustifolia leaf extracts. South Afr J Bot 2010; 76(1): 25-29. Shah MA, Abdullah SM, Khan MA, Nasar G, Saba I. Antibacterial activity of chemical constituents isolated from Asparagus racemosus. Bangl J Pharmacol 2014; 9: 1-3. Sharma DK. Bioprospecting for drug, research and functional foods for the prevention of diseases–Role of flavonoids in drug development. J Sci Ind Res 2006; 2: 391-401. Yasunaka K, Abe F, Nagayama A, Okabe H, Perez L, Villafranco LE, et al. Antibacterial activity of crude extracts from Mexican medicinal plants and purified coumarins and xanthones. J Ethnopharmacol 2005; 97(2): 293-299. Appendino G, Gibbons S, Giana A, Pagani A, GrassiG, Stavri M, et al. Antibacterial cannabinoids from Cannabis sativa: A structure activity study. J Nat Prod 2008; 71(8): 1427-1430. Jayaprakasha GK, Jagan L, Rao M. Chemistry, biogenesis and biological activities of Cinnamomum zeylanicum. Crit Rev Food Sci Nutr 2011; 51: 547-562. Rizwan M, Khan A, Nasir H, Javed A, Shah SZ. Phytochemical and biological screening of Berberis aristata. Adv Life Sci 2017; 5: 1-7. Mufti FUD, Ullah H, Bangash A, Khan N, Hussain S, Ullah F, et al. Antimicrobial activities of Aerva javanica and Paeonia emodi plants. Pak J Pharm Sci 2012; 25: 565-569. Bouhdid S, Abrini J, Amensour M, Zhiri A, Espuny MJ, Manresa A. Functional and ultrastructural changes in Pseudomonas aeruginosa and Staphylococcus aureus cells induced by Cinnamomum verum essential oil. J Appl Microbiol 2010; 109(4): 1139-1149. Naveed R, Hussain I, Tawab A, Tariq M, Rahman M, Hameed S, et al. Antimicrobial activity of the bioactive components of essential oils from Pakistani spices against Salmonella and other multi-drug resistant bacteria. Comple Alter Med 2013; 13(1): 1. Shen S, Zhang T, Yuan Y, Lin S, Xu J, Ye H. Effects of cinnamaldehyde on Escherichia coli and Staphylococcus aureus membrane. Food Contr 2015; 47: 196-202. Mahmoudi S, Khali M, Benkhaled A, Benamirouche K, Baiti I. Phenolic and flavonoid contents, antioxidant and antimicrobial activities of leaf extracts from ten Algerian Ficus carica L. varieties. Asian Pac J Trop Biomed 2016; 6(3): 239-245. Jeong MR, Kim HY, Cha JD. Antimicrobial activity of methanol extract from Ficus carica leaves against oral bacteria. J Bacteriol Virol 2009; 39(2): 97-102. Ullah S, Abbasi MA, Raza MA, Khan SU, Muhammad B, Rehman AU, et al. Antibacterial activity of some selected plants of Swat valley. Biosci Res 2011; 8(1): 15-18. Riaz N, Anis I, Malik A, Ahmed Z, Rehman AU, Muhammad P, et al. Paeonins A and B, lipoxygenase inhibiting monoterpene galactosides from Paeonia emodi. Chem Pharm Bull 2003; 51(3): 252-254. Jamil M, Haq IU, Mirza B, Qayyum M. Isolation of antibacterial compounds from Quercus dilatata L. through bioassay guided fractionation. Ann Clin Microbiol Antimicrob 2012; 11: 11. Hirai I, Okuno M, Katsuma R, Arita N, Tachibana M, Yamamoto Y. Characterisation of anti-Staphylococcus aureus activity of quercetin. Int J Food Sci Technol 2010; 45(6): 1250-1254. Omojate GC, Enwa FO, Jewo AO, Christopher OE. Mechanisms of antimicrobial actions of phytochemicals against enteric pathogens - A review. J Pharma Chem Biol Sci 2014; 2(2): 77-85. Mustafa ZH, Dafallah AA. A study on the toxicology of Acacia nilotica. Amer J Chin Med 2000; 28: 223-232. Patel K, Ali S, Sotheeswaran S, Dufour JP. Composition of the leaf essential oil of Cinnamomum verum (Lauraceae) from Fiji Islands. J Essent Oil Bear Plant 2007; 10: 374-377. Chang MC, Uang BJ, Wu HL, Lee JJ, Hahn LJ, Jeng JH. Inducing the cell cycle arrest and apoptosis of oral KB carcinoma cells by hydroxychavicol: Roles of glutathione and reactive oxygen species. Br J Pharmacol 2002; 135: 619-630. Hume WR. In vitro studies on the local pharmacodynamics, pharmacology and toxicology of eugenol and zinc oxide-eugenol. Inter Endontic J 1988; 21: 130-134. Slamenova D, Horvathova E, Wsolova L, Sramkova M, Navarova J. Investigation of anti-oxidative, cytotoxic, DNA-damaging and DNA-protective effects of plant volatiles eugenol and borneol in human-derived HepG2, Caco-2 and VH10 cell lines. Mutat Res 2009; 677: 4652. Clark GC. Acute inhalation toxicity of eugenol in rats. Arch Toxicol 1988; 62: 381-386. Zhang HJ, Sydara K, Tan GT, Ma C, Southavong B, Soejarto DD, et al. Bioactive constituents from Asparagus cochinchinensis. J Nat Prod 2004; 67(2): 194-200. Goel RK, Prabha T, Kumar MM, Dorababu M, Prakash, Singh G. Teratogenicity of Asparagus racemosus Willd. root, a herbal medicine. Ind J Exp Biol 2006; 44: 570-573. Soleimany V, Banaee M, Mohiseni M, Hagi BN, Dehmourdi LM. Evaluation of pre-clinical safety and toxicology of Althaea officinalis extracts as naturopathic medicine for common carp (Cyprinus carpio). Iran J Fish Sci 2016; 15: 613-629.